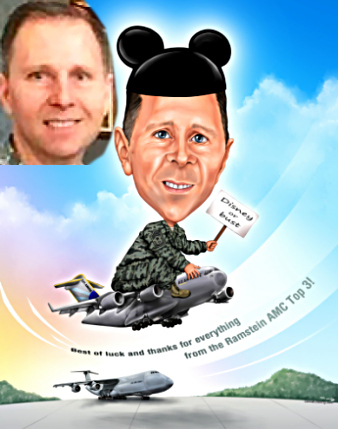 A great military retirement gift idea or farewell gift for a retiring or leaving colleague who you want to give a special custom gift, is a caricature. A custom artwork retirement gift is a great way to signify the time they spent with your team, group, unit etc. In the caricature we can include aspects of their military service including rank, unit badges and insignia, backgrounds that can include locations or equipment that best denotes their skills or operational areas. Often including funny sayings or other notable personal attributes can make for an extra funny caricature that will be welcomed and appreciated by the recipient into retirement. 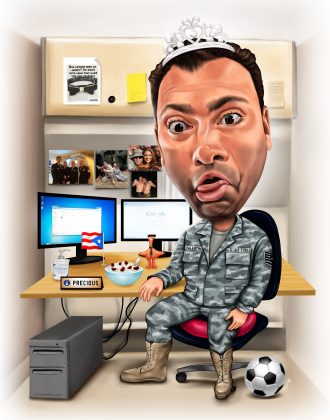 It does not matter if the person leaving or retiring from the military is an enlisted man or a an officer, in the army, navy, air force or marines, a caricature is a great retirement or farewell gift for a retiring or leaving military colleague and is something they will love! Here are a couple of air-force caricatures used as leaving and retirement gifts. One shows the benefit of being able to find a funny photo! In each special aspects have been incorporated, in one the aircraft have special marking for the squadron, the other many small but meaningful inclusions. Art by Darius. See more examples of military caricatures here. You can order your caricature from photo online easily from desktop or mobile device. See our main website. Please select the currency in you wish to purchase. Discounts apply for two or more people. Visit caricatureking.com to see more and other artists.